Doing this allows the creation of an environment that fosters creativity and innovative solutions to customer problems can come alive. But how do we become creative all of a sudden? Many times I’ve heard it said, you can’t schedule an invention. We start by “thinking like a twelve year old”. Why think like a twelve year old? We invoke our twelve year old mindset since it was one of curiosity that wasn’t encumbered by the structured learning process adults go through. An unfortunate by-product of this learning process is that adults stop asking why and how. To think like a twelve year old, we must unlearn many of things we learned becoming adults. To help us with this new way of thinking we look for seven alternatives for any problem we are faced with. Why seven alternatives? Developing a couple of alternatives is easy but developing seven is difficult. This causes us to stretch and begin to think out of the box. To further assist us in our creative thinking we look for inspiration from nature. Natural designs are elegant in their simplicity. Understanding this and applying them to our problem leads to creative alternatives we would never have come up with before. Developing seven alternatives is one thing but we must then quickly turn them into working prototypes. Not fancy and costly prototypes but quick and crude physical mock-ups. We need to make the intangible concepts into something people can look at, touch, feel and even listen to and smell. We activate all of our senses to help us learn more about the prototype. We call this type of learning “Trystorming”. It’s brainstorming with a practical, physical application that accelerates the learning process which becomes a platform for even more creative ideas. We use the learning from several prototypes to refine our designs and converge on an optimal solution. All the while we’re practicing PDCA and with rapid experimentation and feedback. Can we schedule inventions? 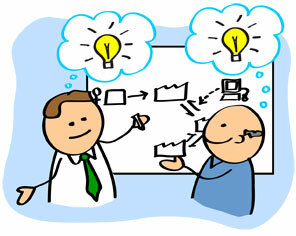 – No, but we can certainly accelerate the process of designing creative value added solutions for our Customer problems. Paying more than list price. Target Conditions vs Random Acts of Improvement. What can we do vs what do we need to do. To be a bit more innovative, we should also try to learn from customers. Many companies develop killer products because they listen to voice of customer. Absolutely. Listening to the Customer to discover both their spoken and unspoken needs is key to innovation. It always amazes me how many organizations fail to do this basic step. business. if you are intersted to know more information about Business Growth so CLICK HERE..